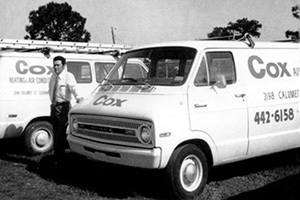 Since 1958, Cox Heating & Air Conditioning has provided expert advice and outstanding customer service to the people of Pinellas and Hillsborough counties as well as the surrounding areas. Our HVAC company has built our reputation over more than half a century by providing courteous, professional service and unsurpassed technical expertise. We offer innovative and cost-effective comfort system solutions for our neighbors here in Florida which includes heating, ventilation and air conditioning (HVAC) service for single-family homes, retail outlets, office buildings, industrial facilities and more. We take pride in our highly-trained employees. All of our installation and service technicians are certified by North American Technician Excellence, which is the only industry-supported certification available that validates the competency of HVAC technicians. Our technicians also undergo extensive and ongoing factory training. 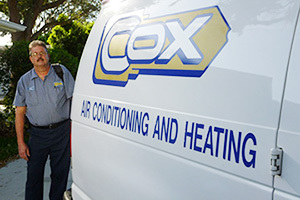 At Cox Heating & Air Conditioning, we build strong relationships with our customers. As part of our pledge to offer premium customer service, we have technicians available 24 hours a day, seven days a week (including holidays) for emergency repair service. Cox Heating & Air Conditioning is part of an elite group of HVAC companies (less than 5 percent nationwide) that can claim this distinction. We have been named a Carrier factory-authorized dealer for Clearwater, St. Pete and the surrounding area. This distinction is one that we were proud to attain, and we work hard to uphold the high standards set by Carrier, which is the world’s leading producer of innovative air conditioning, heating, refrigeration and ventilation products. You can rely on Cox Heating & Air Conditioning to deliver quality heating, air conditioning and ventilation products and excellent service at a competitive price. Call or contact us online.